My mother wasn’t a big fan of the Civil Rights Movement. When we talked about it she pointed out that the Black woman who came to clean our house every other week wasn’t either. This “older” woman had specifically told my mother that she thought things were fine the way they were. With conviction and the excessive exasperation of the young, I assured my mother that of course the house cleaner would say what she said for fear of getting fired for saying otherwise. I still think I was at least partially correct but I didn’t realize at the time that the stakes involved were more complicated than that and the thoughts about it way more subtle and varied among African Americans. 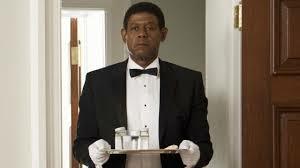 The Butler thoughtfully delineates some of the issues of the time within the African American population. Directed by Lee Daniels and written by Danny Strong and Wil Haygood, we see the movement through the eyes of White House butler Cecil Gaines (Forest Whitaker) and his family, in particular his son Louis (David Oyelowo) who joins the movement. As sharecroppers, Cecil’s mother was dragged away to be raped and his dad was murdered in front of his eyes. He was trained in “service” by a rich employer Anabeth Westfall (Vanessa Redgrave). He eventually obtains a post in the White House, where he works for 30-plus years. The film is “based on a true story” mostly about Eugene Allen who served as a White House butler for 34 years and never took a sick day. In reality it’s a composite of a variety of true stories of White House butlers. 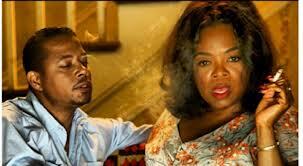 The movie has an all-star cast, with such notables as Mariah Carey, Terrence Howard, Lenny Kravitz and Cuba Gooding Jr. The presidents get little screen-time but are played by a bunch of stars: Robin Williams as Ike, James Marsden as JFK, John Cusack as Nixon, Alan Rickman and Jane Fonda as Ronald and Nancy Reagan. Seeing these actors was kind of fun, especially of course the irony of casting Jane as Nancy, but it was a mistake. Casting these stars created a diversion from the crux of the story, taking us away from Cecil and family and in a way somewhat taking us away from the story as a story. The historical truth of Reagan’s views on race depicted in the film has been refuted by Reagan historians. He did oppose sanctions against apartheid in South Africa, and the movie frames this in ambiguous contrast to his apparent anti-racism in a personal context. But Reagan’s biographers think his apartheid stance was a strategic decision rather than a show of racism. Ron and Nancy were in fact affectionate toward Allen and invited him and his wife to a state dinner. (This occurs in the movie and the Gaines’ become uncomfortable, but again there were many factors involved.) Reagan was the first president to raise the heretofore lower wages of black staff up to those of the white staff doing the same jobs. Who knew? 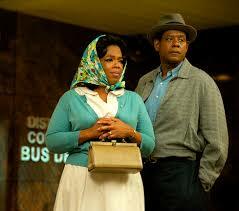 We are offered a variety of life’s juxtapositions among African Americans not often seen in the movies. Cecil’s work behavior must be formal and precise and he has to bend and adapt to his various employer’s wishes. At home with his wife Gloria (Oprah Winfrey) and his friends, he is able to be himself. Gloria drinks too much and blames it on Cecil’s long work hours. Conflict arises when Louis becomes more involved with the Civil Rights Movement. Cecil worries about Louis’s safety and isn’t so sure about the movement’s tactics. Louis becomes more and more disdainful of his dad’s work. Meanwhile his brother Charlie (Elijah Kelley) goes to Viet Nam. Louis’ story could have been a movie in itself. 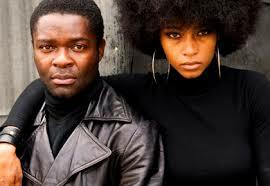 Passionate about the movement he works with his girlfriend Carol (Yaya Alafia) but soon ideological differences between them emerge. And Carol adopts an enormous new afro hair style. (Remember how radical that was?) Things seem to be happening so fast for everyone that it’s hard for anyone in the younger generation to get a grip. Meanwhile Cecil cannot stomach his son’s disrespect. And, as it turns out, Martin Luther King Jr. (Nelsan Ellis) agrees with him. The clash of father and son teaches us a lot about generational conflicts that emerge in the midst of social change. We never doubt that Cecil knows full well that racism is a scourge on American society. He suffers the indignities of racism and classism every day. More than once we see him bowing to serve cookies on a silver tray to a group of young white children visiting the white house. That picture, with Whitaker’s superb acting, is worth a thousand words. Yet Cecil’s work is important to him, requiring skill, patience and discretion. He politely presses for change. He questions the tactics he sees in the Civil Rights movement, especially as things become more militant and more dangerous for those involved. Whitaker is excellent in this role and I wish he had had more to work with. Ultimately there is too much packed into this movie. It’s important and very interesting and a good mix of the personal, political, and intergenerational. I recommend it. Yet more focus would have been helpful to an audience that at times doesn’t know where to look. Interesting facts: As in the movie, Allen’s wife died before just before she could vote for Obama. Allen himself did vote for him and was received as President Obama’s guest in the White House. What a fine day that was.